Caregiving is one of the most noble yet unacknowledged activities in our mobile society. With the break up of the extended family we have lost much of our innate ability and knowledge regarding caring for the dying. Stan Goldberg, through keen observation and personal experience gives the reader valuable insights and practical advice on what to expect and how to survive one of life’s most challenging experiences. Exhausted caregivers who read this inspirational guide will feel reinvigorated..he movingly and eloquently describes how caregivers can prepare themselves and their loved ones for death. Just as a midwife gently helps a newborn into the world, you can gently aid your loved one’s passage at the other end of the continuum, he writes. He’s offering readers advice, compiled from his years of experience, to provide comfort when dealing with the loss of a loved one and to help caregivers maintain sanity during what is a stressful and challenging time.As baby boomers age, end of life issues are being brought out of the closet and given prime time attention. Goldberg specializes in helping people talk about these issues. Among other important topics, this book addresses how to begin talking about what your loved one has meant to you and how much they will be missed; how to balance your needs against theirs; and how to deal with any abuse or negative behavior they may direct at you due to their illness. Goldberg, whose writing appeared in The Best Buddhist Writing 2010, is also the author of Lessons for the Living: Stories of Forgiveness, Gratitude, and Courage at the End of Life. Caregiving can be a depleting process as it often means sacrificing many of our own needs for the benefit of others. Goldberg gives some wise counsel to those who look after others…In a section on what your loved one needs from you, Goldberg includes acceptance and respect; compassion, then understanding; and being willing to listen to a death wish. 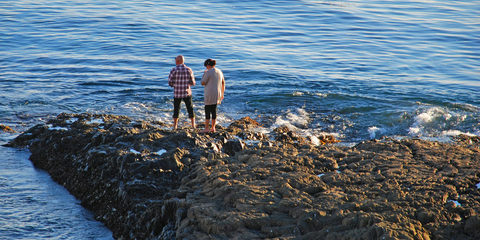 Stan Goldberg, a retired professor of communicative disorders and a therapist in private practice, skillfully navigates caregivers through this terrifying terrain by preparing them for what’s around the next bend, providing them with practical advice, and validating the many emotions they are likely to experience along the way. Tending to a loved one who is chronically ill or dying often leaves caregivers feeling overwhelmed or alone….Goldberg says that the relationship between a caregiver and a loved one is reciprocal. “There are certain things that caregivers can do, like giving a loved one permission to die, that not only help their loved ones have easier deaths but allow the caregivers to reduce the severity and duration of their grief,” he says. 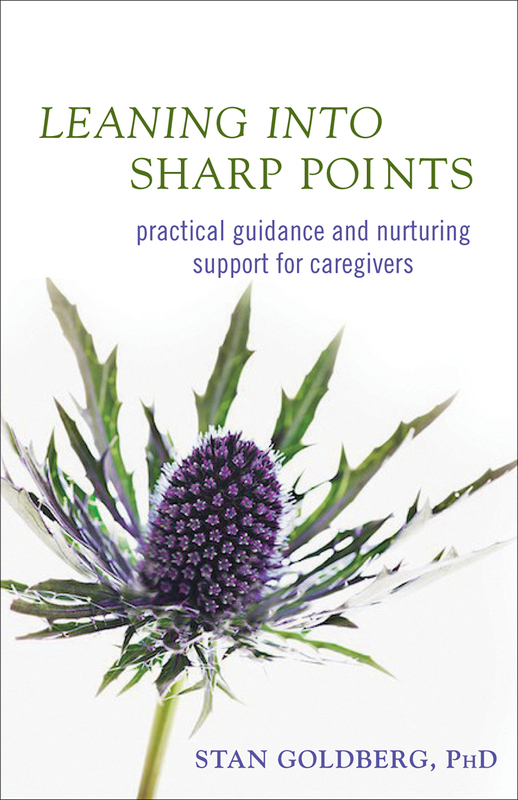 Whether visiting occasionally or caregiving 24/7, they are brushing up against life’s sharpest point. As only one who has been there can, author Stan Goldberg offers an honest, caring, and comprehensive guide to those on this journey. What caregiving amounts to, in the end, is a living out of the profoundly religious notion that every individual is of ultimate and inestimable worth. And although you won’t find much that’s overtly religious in this book, Goldberg writes from a Buddhist perspective…The book is rich with good ideas and practical help — even for those who will never be caregivers but who may be served by one. Goldberg offers a comprehensive guide filled with real-world wisdom for every stage of caring – from diagnosis, treatment, and decline to mourning and recovery. Stan Goldberg’s new book is a gem for a caregiver’s library. The good news is that it is platitude-free and that it comes from real life and real world experience…Goldberg is a professor, hospice volunteer, researcher and family caregiver.. His book is great. As a caregiver myself, I found this book to be invaluable. Stan Goldberg’s loving approach, coupled with practical common sense is just what anyone going through this needs. It is well written and compassionate. I wish more caregiver books were this useful. Goldberg offers an honest, caring, and comprehensive guide to those on this journey. Everyone wants to “do the right thing,” and this book provides the often-illusive how-to. An honest, caring, and comprehensive guide.. Everyone wants to “do the right thing,” and his book provides the often-elusive how-to-from bedside etiquette to advice on initiating difficult conversations, caring for oneself while caring for another, navigating rapid changes in your loved one’s condition, and even offering “permission” for them to die. 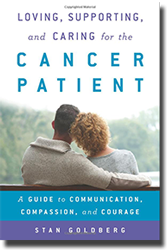 Although chapters in this thoughtful book on supporting caregivers can be accessed as needed for specific information, one may find oneself reading straight through… Goldberg, a therapist who has spent time as a hospice volunteer and caregiver, was moved by his own diagnosis of cancer to write this book, which follows his previously highly acclaimed work Lessons for the Living. Caring for another in the long term can be a very draining prospect for the long run. 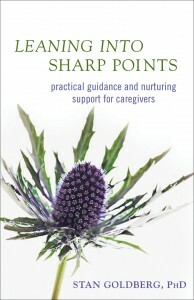 (This book) discusses the endeavor of caregivers to care for themselves as well as the ones they are charged with. From the personal relationships formed, the pressure to do the right thing, Stan Goldberg does well in advising readers to put together their holds on the world…a strong pick for any caregiver looking for inspiration to endure and embrace their lot. In this book, Stan Goldberg offers an honest, caring, and comprehensive guide to those on this journey. Everyone wants to “do the right thing,” and this book provides the often-elusive how-to — from bedside etiquette to advice on initiating difficult conversations, caring for oneself while caring for another, navigating rapid changes in your loved one’s condition, and even offering “permission” for them to die.